Did you really think I could let a holiday like Mother’s Day pass without decorating a tree for it? Of course not! 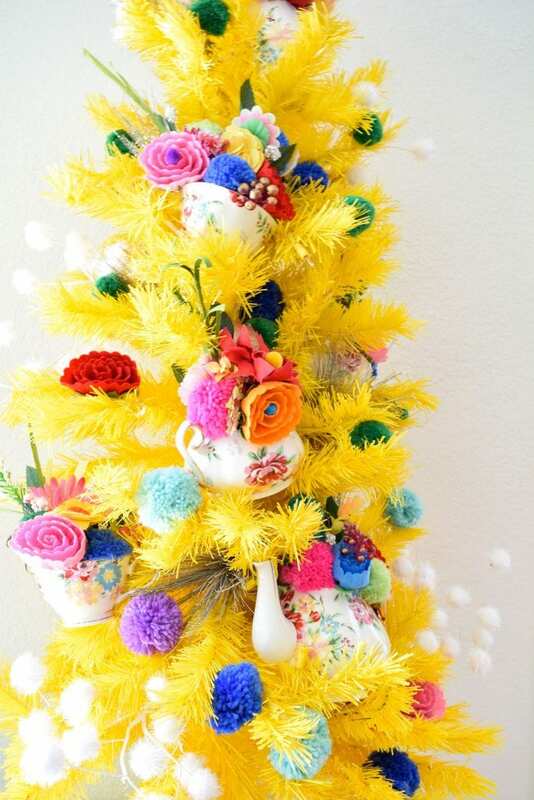 This tree is inspired by traditional Mother Daughter Tea Parties. However, this is not your grandmothers cup of tea. This is my kind of kitschy tea! I decided I would never actually drink tea from this adorable tea set, that did not stop me from loving it! I thought it would be appreciated more as a floral arrangement. 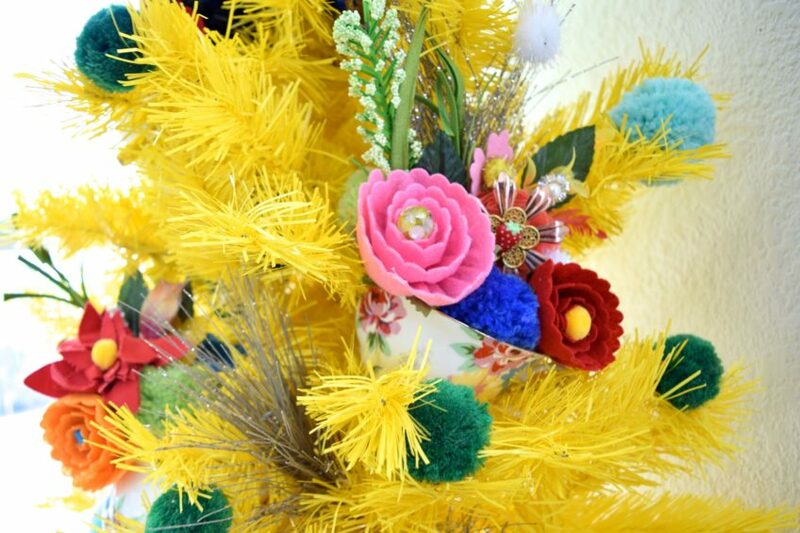 While I was at it, why not put said floral arrangements on a yellow Christmas tree. 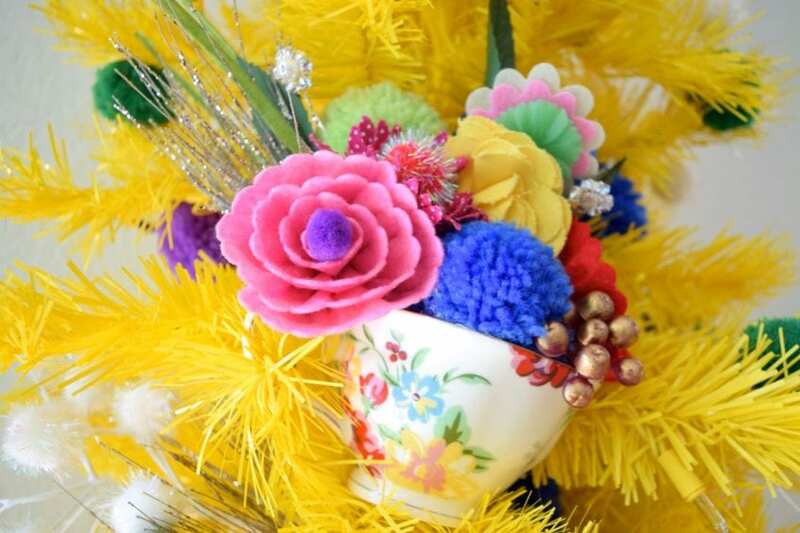 An array of felt flowers, floral springs, pompoms, vintage bits and more were put into tea pots, sugar bowls, creamers and tea cups. This perky yellow tree was originally on the Treetopia Blog (yup that is a sponsored link). This is not my first time at the Mother’s Day Tree rodeo. Remember the adorable pink Mother’s Day Tree I decorated complete with custom embroidery hoop frames and marquee lights? Long after Mother’s Day this tree would still be an adorable in your house. 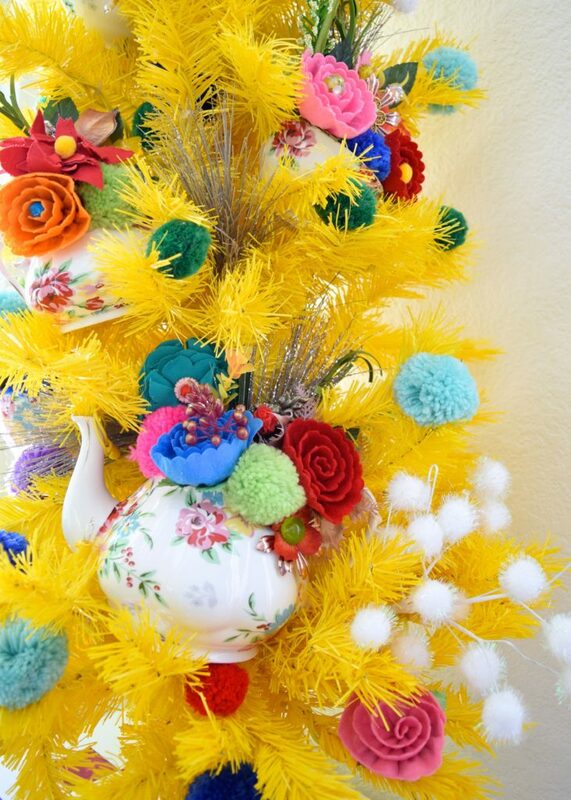 If not the whole tree, remove the tea set arrangements and display them like you would any other bouquet. Another idea is to use mix-matched thrifted antique cups and tea pots. So many ways to spin this idea. Which one will you try? 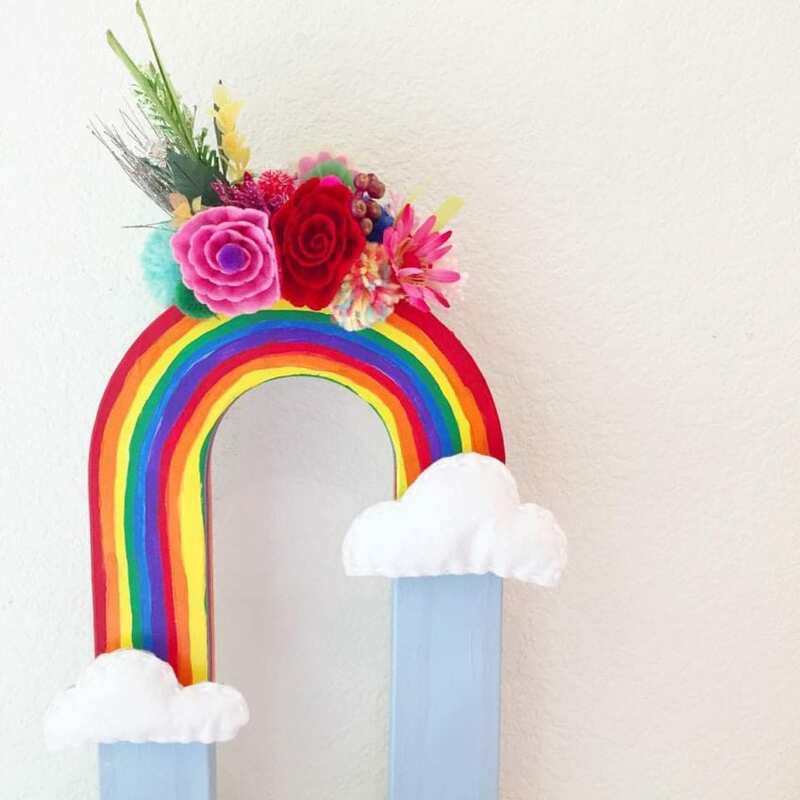 Rainbow Vase – Get the kids together and make mom an arrangement as colorful and perky as a real life rainbow. Living Wreath – Real flowers more your jam? 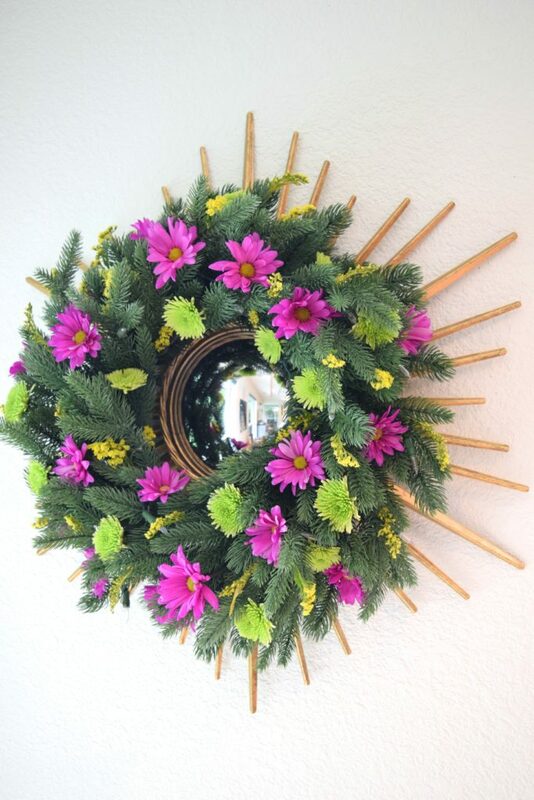 Why not try a wreath with living flowers. 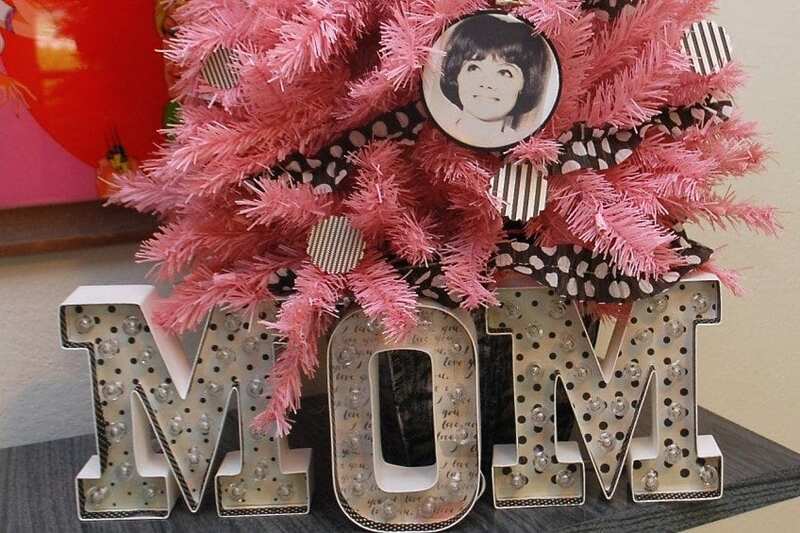 Pink Mother’s Day Tree – Why not add some custom photos in embroidery hoop frames to your Mother’s Day tree? I did! Posted May 15, 2017 & filed under Crafts, Father's / Mother's Day, Holidays, Plant Crafts.